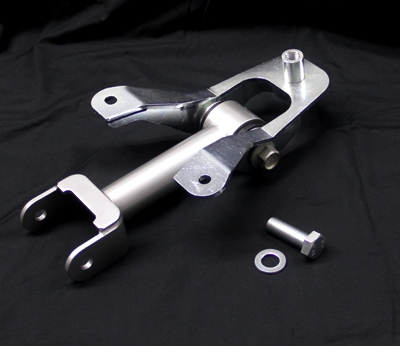 UPR Pro Street Solid Upper Control Arm & 3rd Link Mount Package upgrades your factory stamped steel control arm & mount for your 11-14 Ford Mustang. The factory upper assembly does the job but leaves a lot on the table when it comes to handling and performance. The factory stamped steel parts and large rubber bushing allows for wheel hop, which only gets worse as power is increased. The Pro Street upper is made from Chrome Moly tubing and 1/4" thick end tube and fully tig welded. It also uses Energy Suspension urethane bushings with an oversize steel tool pin that eliminates bushing failures while retaining good ride quality. At 1/4" thick our 3rd link mount is twice the thickness of the factory stamped part and fully tig welded. All of our Suspension Products are made with the Highest Quality materials and most expensive components. We spare no expense on our products and always stand behind them with our Lifetime warranty that no one else offers. 2011 2012 2013 2014 Mustang 5.0L Coyote 4V V6 V8 GT GT500 Boss 302 Shelby Steeda Saleen and Roush Vehicles. No one else can stack up to the bold clean styling of our aftermarket Billet dress ups, Street Strip & Racing Suspension & Performance Parts for your late model American Muscle Car!